When I started my first online business in college, I had no idea what I was doing. I went through so many ups and downs and ultimately sold it for about break even. What I did learn though was priceless. I know its a cheezy cliche from AMEX but I couldn’t put a price on the lessons I learned about online marketing. Times were different then and most of the techniques I used back then are outdated now. I joined link exchange networks, ran cost per impression banners, and scraped emails from eBay. It was the wild west and I had to be scrappy. I had limited resources and limited knowledge. Besides limited information there weren’t the tools that exist today. Today things have changed. The tools and resources available are far superior. More importantly, the techniques for driving traffic to your site have changed. The flavor of the month is content. Content and collaboration is what drives people to your site. If you haven’t heard it already, you will. Content is king. blah blah. Google has continued to refine their algorithms to weed out the black hat SEO techniques. They are rewarding sites with legitimate content. Outside of content, backlinks are still crucial. Backlinks are still at the core of Googles search ranking system. Wondering what are backlinks? We cover that here. To save you the time in reading this, its a link from one site back to your site. Lastly, social signals are playing a more important role in search rankings as well. The combination of content, backlinks and shares are your lifeblood. They are the keys to driving traffic to your site. Unfortunately this takes time. As my wife started building her online store, she knew SEO was crucial in her success. This meant that she was going to have to attack all these angles. Content she could handle. If she stayed committed should could continue to put out relevant content about her topic. The content game is a long play. You have to produce the content, optimize it, share it, and wait. Your content will get indexed and you can hope people will share it themselves. But what if that never happens? What if nobody comes or nobody cares? Generating great, relevant content is not enough. You need people to see it, share it and backlink to it. This unfortunately doesn’t happen by itself. You have to go find people. These people are bloggers. Bloggers are influencers who often have large followings of people. But how do we find them? How do you find bloggers? There are a lot of ways to find bloggers online. The latest tool we are using is called Ninja Outreach. Ninja Outreach is software made by our friend Dave Schneider. Dave has put some serious time into Ninja Outreach and it shows. The software is designed to find all types people. For this exercise we are using it to find bloggers. The first thing to know is that not all bloggers are created equally. We want to find the studs. We want to find people with that have followers. Ninja Outreach helps us do that. We will show you how we sort out the weak bloggers and focus on the cream. 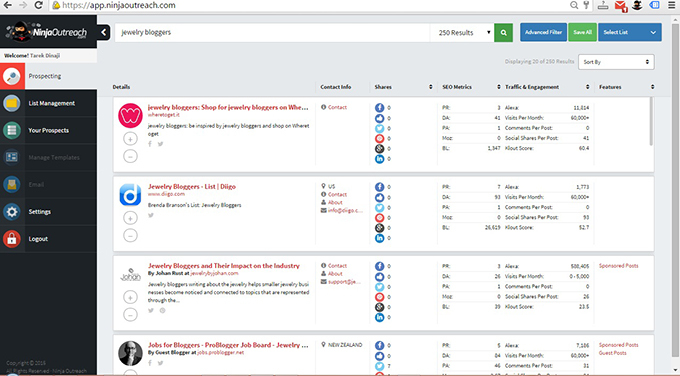 The first step in using Ninja Outreach to find bloggers is to figure out how to search. While this seems straightforward, it requires a little skill. Similar to searching on Google, you want to be specific. If you are too vague with your search, you are going to get vague results. Fine tune your search. With my wifes fashion jewelry site, the first search I tried was jewelry. This resulted in a bunch of large jewelry brands. Useless list of large jewelry players when I’m looking to find bloggers who are approachable. That’s not what we are looking for. I then refined the search to jewelry bloggers. The results were more targeted and closer to what we wanted. I started to get actual bloggers or jewelry blogs. Once the results start showing up, there is lots of data on the screen. Don’t be intimidated. There are a lot of factors you want to review when you are looking to find bloggers. First I like to make sure the blogger has a legitimate website. It seems simple and straightforward. There are quite a few bloggers that are only social bloggers. They may have a huge Instagram and Facebook following but no physical site of their own. This doesn’t interest me. I want backlinks and I want juice. Ninja Outreach only returns websites so this simplifies the process. You want to look though at the actual site. Is it the actual bloggers site or a post about them on someone elses site. The next thing I look for are bloggers with sites that have a DA or domain authority above 20. Breaking down DA is for another day but this number comes from the SEO company called Moz. This number by itself can be misleading. Many bloggers host their blog on blog platforms like Blogspot or WordPress. For example one of the the results was hollysfollybeads.blogspot.com. The DA was 93. The problem is that the 93 is for www.blogspot.com and not specifically for her blog. If the blog doesn’t reside at their own domain name (ex: www.hollysfollysbeads.com), you have to look at the PA. The PA refers to the page authority and tells you the value of that particular page is. In this case hollysfollybeads has a PA of 0. I have nothing against her but unfortunately this is of no value to me. The beauty of Ninja Outreach is that all these figures are in one easy to find place. Trust me when I tell you, it can take hours to try and collect all this information to compare. The information is thorough. 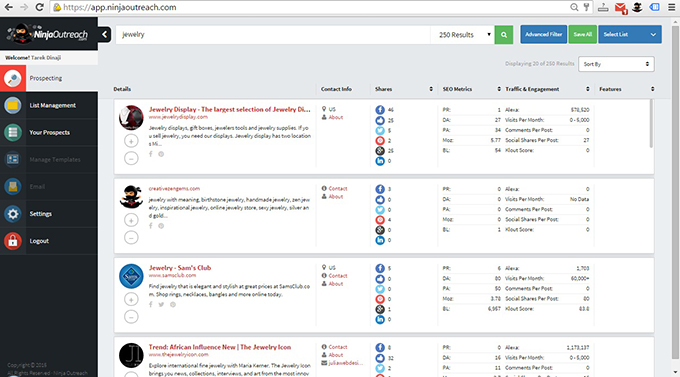 It includes Alexa rank, PR, specific page shares, contact information, and social profile links. Ninja Outreach provides links to each of their social profiles but would love to see a link to their Instagram. From an online retail perspective, this is e important to my wife. She likes bloggers with a large Instagram following in addition to the other standard social network metrics. After reviewing all these figures, I look for the persons Klout score. Klout is another site that provides some clarity on peoples influence. They measure all your social interactions and combine the blended average to come up with one number. That number is your Klout score. Its a number that you can easily use to measure someones social influence. I like to reference this number to find bloggers and compare them against one another. Anything over 30 is a good bet. I personally look for Klout scores above 40. The process to find bloggers takes some time. You have to be patient. While Ninja Outreach saves hours and hours of time, it still takes work to narrow down your list. The idea is to search for a particular topic or heading. From there you will see the results from particular blog posts or articles. In my case some of the results were posts about top jewelry bloggers. I actually went into these posts to review the lists. From there I saw the names on the list and then searched for them. I continued to refine my search terms to get bloggers that made sense for my wife. You may search one term and only find one blogger that meets the criteria you are looking for. Refine your search further to find your bloggers. The nice thing about Ninja Outreach is that you are able to create a list to save all these people. Once you find the ones you want, save them. They are removed from the search results and added to your list for later. Feature Request: One thing that I wish Ninja Outreach did was pull over social profile information. One of the things I look for when I want to find bloggers are stats about their social status. It does a nice job of linking to the different social profiles. If it showed Facebook Likes, Twitter Followers, Instagram Followers, that would be great. UPDATE: With the new web based version you are seeing shares and a lot more social information. Now its time to collaborate with these bloggers. Ninja Outreach actually has a full campaign and email system built into it. For our techniques though, we are going to use less of a blast approach. The following is a break down of two approaches that my wife has used to collaborate with bloggers for her online store. These two approaches get your content noticed, shared, and backlinked. The closest way to someones heart is their ego. When you’re first starting your online business, its tough to get people to pay attention. You are a nobody and nobody seems to care. The best way to get noticed is to praise people. But who should you be praising? Bloggers. Thats who. For these particular techniques we are looking for backlinks and social sharing. By appealing to these bloggers, we are hoping to have access to their followers. I also wrote recently about using influencers on YouTube with FameBit here. Now that we have collected our bloggers we are going to craft a blog post around them. You want something that makes these bloggers feel special. The one post my wife wrote was 10 Jewelry Sites You Should Know About. This was to showcase other jewelry sites to raise her own awareness. You are creating a list of bloggers or sites or anything that you can group together. You then are calling them the “Top” or “Best” or anything complimentary. Remember at this point you haven’t reached out to these people. You are just creating this list yourself. Two sites that were featured in my wifes post and ended up sharing the content with others. Its easy enough to write a little blurb about each blogger or site that you have included. Be sure to point out their strengths and what you love about them. The more complimentary the better. I like to make sure that the list includes some “stretch” large brands and also more attainable smaller brands. The likelihood that huge brands are going to share or link to your content is not high. The likelihood that the smaller bloggers or brands will is far more likely. Furthermore, the small bloggers are going to feel great about being included in a list of more prominent ones. Once your post is complete, its time to share the love. From Ninja Outreach, you should have collected each of these bloggers social names. You will start sharing the post publicly on your social channels and tag the people included in the post. Continue to do this across all your different social channels. This should be enough bait in the water. If you want to go one step further you can email them by using the email address you collected from Ninja Outreach. A simple post to say I thought you would be interested that I included you in my list of blah, blah should work. If you have adequately praised these people, you can sit back and reap some benefits. Social shares, backlinks, and more. You have now collaborated without them knowing. My wifes first attempt was with jewelry sites. Her next is about jewelry bloggers specifically. Find bloggers and people as opposed to brands. When you mention someone by name instead of by brand, its more personal and more effective. This technique works and you can see some of the responses she received from her first post here. Now this technique really depends on the particular business you are in. In my wifes case she has an online store and she is trying to drive people to her ecommerce store. She sells jewelry but doesn’t love to give it away. In her case, she is not the brand. There is a fixed wholesale cost that she pays for the jewelry. This is higher than the manufacturer. Because of this, she prefers to give a gift cards or gift certificates to her store. This has a number of benefits that we talk about in our post about whether or not an online store should do shows. In a nutshell she gives away the face value but they are using it at her store. Second, there are a certain percentage of people who will never redeem it. Third, these people often end up spending more than the gift amount when they actually redeem it. For this technique we actually reach out to the bloggers you have found to offer them a free giveaway. See there is a little secret about bloggers that most people don’t realize. They have to blog. Blogging means they need new content and something to talk about. Giveaways are great for them and for you. The first step in this process is making sure you have the appropriate level blogger. When you find bloggers, you need to make sure you are not searching for the biggest and best. Its not realistic. These bloggers can have millions of followers and highly trafficked sites. These bloggers are coveted and make serious livings from brands and endorsements. You need to know your size. The top bloggers are often paid thousands and thousands of dollars just to give away your product. This is not your sweet spot. Or at least its not my wifes sweet spot. She is looking for bloggers that have large enough followings. They need to be beneficial to her but not too large and commanding top dollar. Fashion Blogger the Blonde Salad has Burberry sponsoring her whole site right now with a popover and background image. Big bucks for this. Once you have your list of bloggers narrowed down from Ninja Outreach, you can create a campaign. The software lets you email directly in their platform. We prefer to target them one by one. Your pitch is pretty clear. You follow them on twitter or Instagram or whatever you want. (make sure you are following them) You love their style and would love to do something with them. Mention that you’re a smaller company. Being big doesn’t work when you want to save money. Also mention that you would be willing to give them a gift card or coupon code. They can host a giveaway. Don’t get into the details before you have a bite on the hook. Short, sweet and to the point. Once you send enough of these out, you will start hearing back from them. Its time to party. At this point you can ask for anything but tread lightly. My wife likes to ask for a link on a blog post about the giveaway from their site as well as social shares. She also tries to make following her social accounts and or opting into her email as a rule for entry. These details can be fine tuned based on what you are looking to do. Remember though if you don’t ask, you won’t get. Below are some of the social sharing she has received. 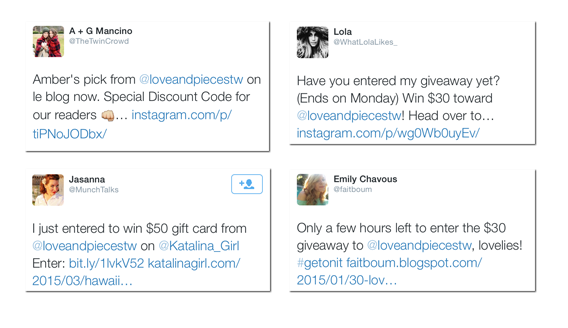 These are from giveaway collaborations with bloggers. 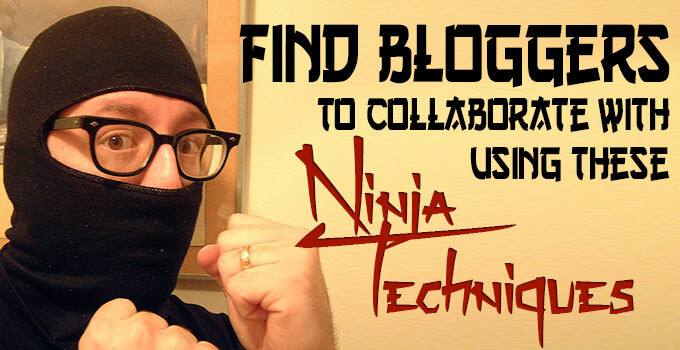 So once you find bloggers whether you use Ninja Outreach or not, you need to get creative. Any collaboration is good for your brand and good for your traffic. You can start will smaller bloggers and work your way up as you are more comfortable or have more money to devote to promotions. Its a slow crawl to the top and consistency and perseverance separates the the successes from the failures.